Despite our best-laid plans, classroom transitions can sometimes get sticky. Technology is glitchy, students need work because they are leaving early, a teacher or administrator stops by your room, or papers are misplaced. 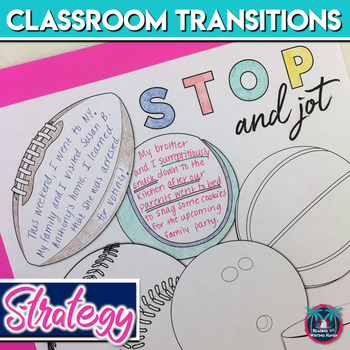 It's always a good idea to be prepared with a classroom management strategy, like this classroom transitions activity. The basic premise is that in between parts of the lesson, students are asked to reflect on what they just did or anticipate what will come next. To do so, use a graphic organizer with appealing images! Give students a meaningful prompt, and ask them to write their answer on one of the shapes. For example, you might ask students to draw an image of a vocabulary word on their list after completing a vocab bell ringer, or you might ask them to predict what they think is going to happen next in the novel you are reading. 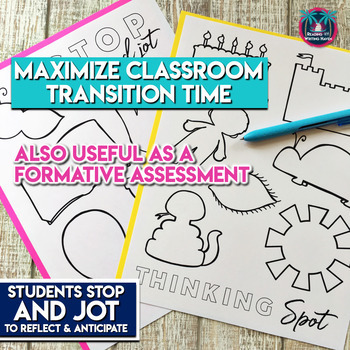 Filling transition time with meaningful reflection and critical thinking is a good way to keep students focused so that you can get organized and mentally prepared for what's happening next. The 1st version has only clipart images. The 2nd version has numbers next to each image so that you can easily tell students which numbered shape to use. The 3rd version has labels for students who aren't sure what the images are or for students who are still acquiring the English language. The information students write can also function as a formative assessment for you to have a window into their thinking about activities they have just completed and those they are about to begin. This classroom management resource is intended to be used with grades 6-9, but you know your students best. It can work for those younger and older as well. If you feel like your classroom transitions could use a little tidying, give this strategy a try. 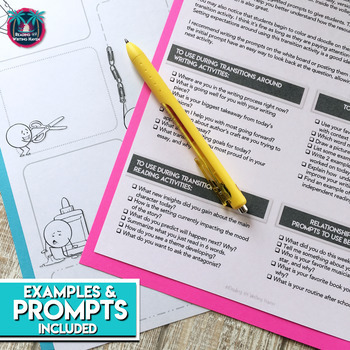 If you would like to use this resource for a different purpose, the graphic organizers can also double as a stop and jot activity for students to record thoughts during reading. Want to know more about improving classroom transitions? You can read this post. Looking for more teaching resources? Try these. * Be sure to click the "follow" button that is located next to my picture so that you can hear about sales and new products! * By providing feedback on your purchased products, you can earn points, which ultimately translate into cash toward future purchases...bonus! Plus, I'd love to hear from you. Duplication limited to single classroom use only.